This poster was made as an assignment for a 3D modeling course. 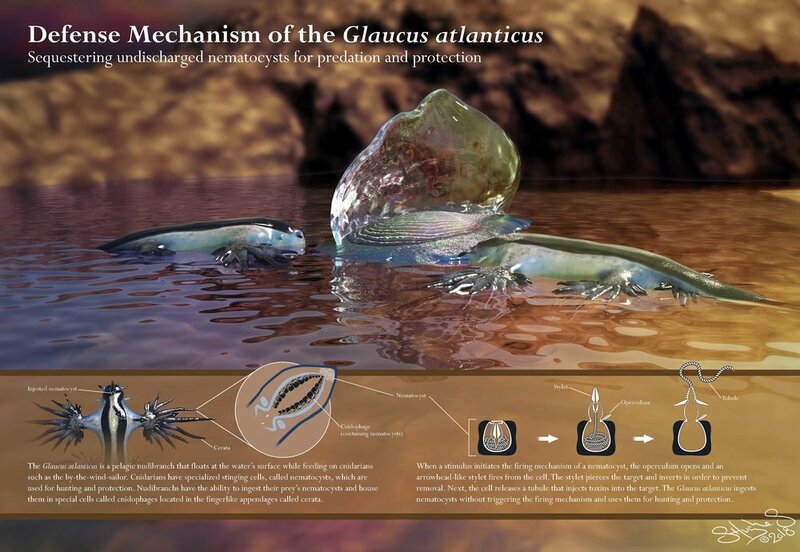 The assignment was to accurately portray a biological defense system using 3D assets. The defense mechanism of the Glaucus atlanticus is a unique adaptation to its surroundings. This nudibranch preys on cnidarians and consumes their cnidocytes (stinging cells) without triggering their firing mechanism. The cnidocytes are then kept in the nudibranch's cerata for use in predation or defense. This piece is designed for use in an intro level biological sciences course. It combines a unique, interesting mechanism with captivating visuals to catch the eyes of students and teach them about one of nature's incredible creatures. All 3D assets were modeled and painted in Pixologic ZBrush. Materials were designed and the scene was rendered in Luxion Keyshot 6. Compositing was accomplished in Adobe Photoshop.